For her residency at Roulette, Saxophonist/Composer Matana Roberts will be using the evening as a performance lab, experimenting/workshopping/considering conceptual ideas that are the building blocks of her work in progress, blood narrative COIN COIN as well as holding a Q&A about her practice. This will not be a new chapter of the series, just a consideration of new thoughts she may infuse into the work as a whole somewhere along the way. Support for this program provided by the Jerome Foundation. 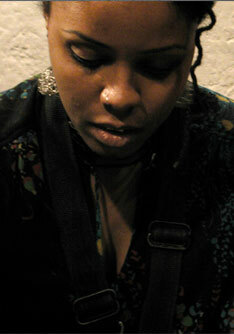 Matana (m(a)-ta-na) Roberts; internationally documented, chicago born saxophonist/improviser/ composer/sound conceptualist; working in various mediums of performance inquiry; has created alongside visionary experimentalists of this time period in various areas of improvisation, dance, poetry, visual art, theater; as a saxophonist, documented on sound recordings as collaborator, side woman and leader. some recent work focused on the place/problem of memory/tradition as recognized, deciphered, deconstructed, interrogated through radical modes of sound communication, alternative styles of musical notation, and multi genres of improvisation; based in new york city.